LUCY BURDETTE: I hate war and I won't watch war movies and I cannot imagine psychologically surviving the horror of any of it. But I used to make myself watch the honor roll of soldiers that the PBS Newshour ran at the end of their program every week during the heyday of the wars in Iraq and Afghanistan--so I wouldn't forget that the deaths we were hearing about were real people with real families. And so too we shouldn't let Memorial Day pass by without thinking of the folks who sacrificed for us. My father was a WWII veteran. (That's him, above, in Wales.) We have paperwork that documents how he went down to the recruiting station in New Jersey and signed up. But then his mother (a VERY strong personality), marched him back down to rescind his application. He signed up again the following year (1943?) and served in the Army corps of engineers in England and France. Although in ordinary life he was a kindhearted, peace-loving guy, I am certain that serving in the Army was one of the most powerful experiences of his life. He always felt connected to his fellow soldiers--they had yearly reunions until they got too old to travel. One of them hobbled up to visit him in the nursing facility just months before he died. When he sat down to hand write his memoirs, most of the vignettes were about the war and his friends from those years--so much for our childlike perspective that we kids took top honors in his life. HANK PHILLIPPI RYAN: We try not to be too political here, so let's not argue wars or where which troops are fighting which other troops. But on Memorial Day, how can we not think about it? I think about my father, at age 18 or so, being sent from high school in Indiana overseas to fight in World War II. You have to know my Dad is the most thoughtful, artistic, tolerant, poetic, gentle person you could ever met. A musician. A writer. I simply cannot picture him with a weapon, a member of the army infantry fighting in the Battle of the Bulge and taken prisoner and marched barefoot through the snow and put in a Nazi prison camp. But that's what happened. He got a purple heart. My little dad. If I've told you this story, forgive me. But on Memorial Day, the goal is to remember. So it's important to tell and re-tell and make sure the memories aren't lost. A few years ago, Dad and his wife Juliet (now both retired from the foreign service) rented a house, as usual, in western Massachusetts (near Tanglewood) for part of the summer. Jonathan and I went to visit for awhile. 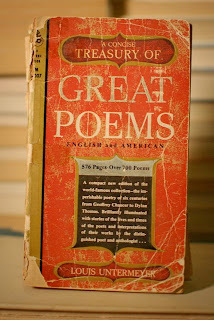 And in the library of the house they rented, Dad found a tattered and worn book of poetry, one of those paperback Untermeyer anthologies. He pulled it out of the shelf, and tears came to his eyes. "You carried a book of poetry in the war?" I was trying to figure that out. "Yes," he said. "To remind myself there is beauty in the world." RHYS BOWEN: My dad was in World War II, in the desert fighting Rommel. He fought at El Alamein, but from what he told us, he actually enjoyed some things about it--the camaraderie of men together. He was a great athlete and played cricket for his battalion. He also picked up a lot of Arabic and years later he and my mother went on holiday to Tunisia and the hotel staff were amazed he could speak to them. They got wonderful service. My brother was in a very different sort of war. In the RAF he was sent to Aden, South Yemen. Very like Iraq today. They'd go out on patrol and a sniper would kill the man in front of him. Not good for the nerves. Both he and my dad are gentle people. My brother is about to be ordained an Anglican priest! War is so stupid. As the song says "When will they ever learn?" My father was in his mid-thirties when the US entered WWII, with a business and a toddler (my older brother) so wasn't called up. And he was such a gentle man--I think the experience would have destroyed him if he'd survived. DEBS: I had two uncles who served in the Navy. One was stationed in New Zealand for at least part of the war, and could never afterwards bear the smell of lamb. Neither of them ever talked about their wars. I've been fascinated since I was a child (Anglophile that I am) by the British experiences in WWI and WWII, particularly as they affected the British at home. One of my books centers around children who were evacuated from London during the Blitz, another around a Jewish couple who come to London as refugees from Nazi Germany. served -- I think it was because he'd had rheumatic fever as a kid, or maybe it was his flat feet. I wish he was around to ask. 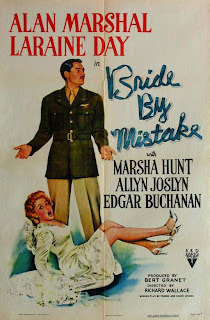 Instead he and my mom wrote their first screenplay in 1944, "Bride by Mistake," a frothy romantic comedy with a rich woman looking for a soldier who doesn't want to marry her for her money. My husband's father worked in a Providence shipyard for his service, and came away with no fond memories of Providence and a lifelong aversion to cold. JULIA SPENCER-FLEMING: Lucy, I am a member of "one of those families" you mentioned. My father, Lt. Melvin Spencer, served during a different conflict - the Cold War. He was an Air Force pilot, assigned to a Strategic Air Command bomber wing at Plattsburgh AFB when he met and married my mother, who was a coed at the State University there. Tensions between the USSR and the United States were at a peak in the early 60's, and the USAF was at the front line of defense. Bombers stood fueled and ready on the flight line apron round the clock, with crews rotating in and out of specially connected staging areas so that the enormous planes could be airborne and on their way to Russia within a matter of minutes. The day I was born my father was in "the bullpen." His replacement pilot arrived in time for him to get to the base hospital, but he was still in full fight gear the first time he held his baby girl. The crews trained constantly over the huge, sparsely populated reaches of the Adirondack mountains, making practice bombing runs. About six months after I was born, my father suited up and left for a pre-dawn training flight. He never returned. One of the B-48's systems - radio? Electrical? - malfunctioned. Flying in the dark, in a snowstorm, the four-man crew never realized they were below altitude. The remains of the ship were found strewn across the face of Mount Wright, the second highest peak in the Adirondacks. This is the memorial placed at the crash site. I think it's enormously important to be aware to the cost of war to those who pay the ultimate price. But it's also important to remember that for every name on the casualty list, there are a score of others whose lives will never be the same - parents and siblings, husbands or wives, children and friends. HANK: Julia. I am speechless. And So grateful to know you all. So what about you, Reds? War stories? This is the day to tell them...and to say thank you. No war stories, just military service in our family. John flew with the Navy, retiring after almost thirty years of service. Our youngest daughter is in the Navy; our oldest daughter graduated from the Air Force Academy and served in the Air Force for several years. Memorial Day is truly a time for reflection and remembrance. To all who have served, who have sacrificed so much for our freedom, we thank you. Such a crew of gentle fathers in wartime. My father, a shy gentle intellectual, was drafted out of Indiana University and sent to Cal (UC Berkley) to study Italian, where he met my mother at a dance her sorority threw for the soldiers. But instead of going to Italy they sent him to a remote post in India where he monitored radio traffic or passed along messages or something. On the ship over, he created and ran the ship newspaper. In India he wrote letters to my mom every day. Like others, I can't ever imagine him carrying a weapon into conflict, but I'm sure he had to train for it, and if called, would have done it. He taught us various military songs, the anthems for the several forces, that we sang around the campfire while camping. Wow Joan, that's a lot of service from your family--we thank them! Edith, that's a lovely story. Imagine him sent to India with all his freshly-learned Italian. did you keep all the letters? Both of my grandfathers served in WWII. 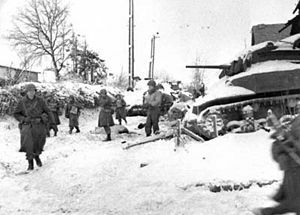 My mom's dad died before he could tell any stories, but my dad's dad was in North Africa with the 1st Armored Division - a medic. He went to reunions until there wasn't anybody to reunite with. His favorite story was that they wanted to give him a Purple Heart because he was injured in an air raid. "I jumped in the fox hole and some idiot left the shovel in it." He declined the medal. Mom's mom was a Navy nurse, which is how she met my grandfather. My other grandmother was a "Rosie the Riveter." My dad was in the Army Reserves for 20+ years. My husband served six years on active duty with the 3rd Special Forces (airborne, but he was an intelligence analyst). He did a stint in the first Gulf War and was deployed again in Iraq (the kids were 5 and 3 - that was fun). Wonderful story about your grandfather Mary! and your family did a lot of serving--we thank them too! Yes, Roberta, I have some of the letters they wrote back and forth. Cannot part with them. My dad served on a destroyer in the Pacific. He never talked about the war, though he told me once that D-Day was the most important day of his life. Afterwards, he was stationed in San Francisco where he met my mother, a Cal student. They delighted in telling the grandchildren about their SF courtship. What a touching collection of stories...Keeping these memories alive is a way to honor our fathers. My story is similar to Julia's. My father was a Naval intelligence officer and pilot, flying reconnaissance off the coast of Rhode Island in 1941. His plane, without the instruments we take for granted today, apparently flew into a dense fog and crashed in the sea. The remains were never found. I was less than a year old so have no memories of my father, but grew up with many family stories about his integrity and bravery--and a life cut short. My mother remarried fairly soon, so I grew up with a stepfather who was a good man. He was a flight instructor, considered too effective at training pilots to be sent overseas. He always regretted not seeing combat. Hank, your dad's story brought tears to my eyes. All to many soldiers are so changed by their experiences, and it's often so unnecessary. I'm another one who refuses to watch TV or movies about war, although Herman Wouk's books were once right at the top of my favorites list of epic novels. My father-in-law is the only family member who ever talked about his service (one of my uncles was held in a POW camp for more than a year, so it was too horrible to discuss in our family). But Steve's dad, who was too old to be drafted for WWII, signed up, much to his wife's horror. He was a photographer, and ended up, through sheer dint of will, working as a combat cameraman under no less a commander than Ronald Reagan. My brother-in-law Pete, who was a professor of military history at University of Nebraska, eventually wrote an entire book dedicated to the men who worked the cameras right alongside the bombadiers; the name of the book is Armed with Cameras. When I was in Peru our guide told us about how many different varieties of potato are grown there (well over 3,000, amazingly), including one that lowers testosterone levels. I submit that every world leader should be fed a steady diet of these, so we might have a chance of not having so many damned wars. 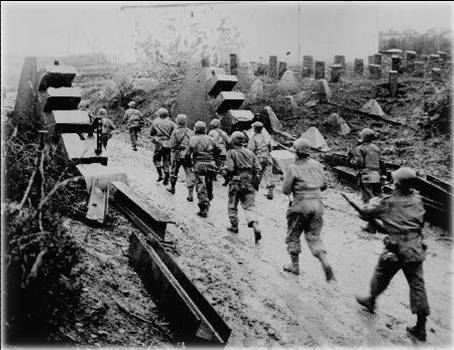 Father's Day and the 70th anniversary of D-Day. Thinking of those men who went off to war in WWII--the experiences they had no matter where they served--those who survived and came home again. Old men, now, the last of that wartime generation. Just recently, Frank Merrill Sidmore passed away at 96. He was my dad's commanding officer in New Guinea, and I'd hoped to communicate with him about his memories of my dad during that time. Too late. By the time I even knew his name, Mr. Sidmore was too ill. My father was just a young man in his early 20s, fresh from the hills and hollers of eastern Kentucky, thrust into an alien environment, a nightmare of combat against heavily entrenched Japanese forces in both New Guinea and the Philippines. What I do know is this--the nightmares followed him to the end of his days--of the men he could not save, of the friends he saw die. The young man who went off to war came back changed. What kind of man would he have been had he not had to endure those experiences? I can't say. All I can say is this: I salute you, Daddy, salute your courage and your bravery and your great heart, so that even now, the men who served with you have thought of you every day since. May God grant you always and forever the peace you so richly earned. May my love for you endure forever. I love you, Daddy, and not a day goes by that I don't think of you. My dad, too, was in WWII. He died in 2007, and I wish he could have made it to take an honor flight to the WWII memorial. So after Malice this year, I went for him. He was in Patton's army that liberated the concentration camps. Never talked about it until a few years before he died. Like many of your parents, he came from a small town and had never been far from home when WWII broke out. Fortunately for me, he was scheduled to invade Japan, but after the bomb was dropped, plans changed. I was the first order of business when he came home--family myth has it that he gambled on the ship home to get money for my baby shoes (not sure I believe that one!) I was one of the boomers born in 1946, and I will always feel thankful that he came home and we had him until age 87. Dad didn't serve. He was one of the ones selected by the Otis Elevator Company to develop their aeronautical division. My Uncle Karl died on the USS Quincy in Savo Straits, My brother served in Viet Nam as did my husband, neither talk about the war. My husband stayed in the service (he was drafted into the Marines, stayed reserve and he received his engineer degree was offered choice of assignment if he would re-up full time. He opted to join the Air Force and learned to fly. My Uncle Jimmy was in the army in WWII - one of my favorite pix of him is of he and his wife (who is wearing a full mink coat - go figure) standing next to an unexploded shell in Nebraska. I don't know if the shell was a dummy, or what the story was, but there they are, next to the shell, surrounded by prairie as far as the camera shows. One of my writer friends here in Delaware, Terri Clifton, lost her son Chad in Iraq. He was a Marine. He was 19. Even in his Marine uniform, he looks like a child. He was KIA in 2005. He is buried in Arlington, with ah honorary marker here in Dover. Terri and her family formed a foundation in his name, and had a concert yesterday to raise money for Guitars for Vets, a musical therapy program they support. Remembering is great, it really is. But I think helping out the vets still with us, is better. Hank, love the carrying of poetry. In Stephen Crane's "Lifeboat" one of the men recites to himself a poem learned in school, a lifeline in crisis. My father's heart murmur kept him from enlisting, so he worked construction on roads and runways in Alaska and Hawaii. I do wish for a time without war . . . and have cried with students' mothers as they left us . . .
What beautiful and moving stories. Thank you all for sharing. Yes, it's important to remember. Another lyric, "War! What's it good for? Absolutely nothing!" My father lied about his age and joined the Navy to learn to fly. He flew the Pacific during WWII on what he called "the milk run." Carrying food supplies and such. Most of his buddies were lost not to enemy fire, but from their planes falling apart in mid-air. They were given the least desirable planes which were, he said, held together with wire. He, too, had a problem with lamb. Every bit of fat had to be cut off or the smell reminded him of the mutton he had eaten. We also never had Spam in the house. He'd had too many Thanksgivings and Christmases with Spam as the entre. Yes, thank you, everyone, for sharing your own families' stories. Here's hoping we never have another generation that had so many fathers serving under arms. All of these different war experiences are so important to know and remember. Julia, I am heartbroken for you with the loss of your father while you were still just a baby. How cruel it all seems, and how cruel war is, because, as you said, Julia, the tragedies are so far reaching, leaving people behind to pick up the pieces of shattered dreams and lives. Lucy, your dad was certainly persistent, and his mother sounds like quite the force, too. Of course, we mothers are ferocious in the defense and protection of our children. Hank, what a poignant moment for your father! And that you were there to share it, such a gift. Rhys, I haven't read about the desert fighting as much, but it's now on my mind. Debs, I love the connections in some of your books and characters to WWII, especially Erika Rosenthal. Hallie, I bet your parents lives in the film industry at the time of WWII has many fascinating aspects to it. My father, born in 1901, was too young for WWI and too old for WWII, so I don't have any war stories there. However, my father-in-law lied about his age and joined the Navy when he was 16. The reason he did so was because his older brother was in the war and had been captured by the Japanese. You all are probably familiar with the Bataan Death March. Well, my father-in-law was bound and determined to join and search for his brother. Naturally, it didn't work out that way. He served in the Pacific though, and we were fortunate to get his experiences down on paper and tape when my daughter had a high school project she was doing. My husband was in the Army Reserves when he was activated in 2002 and sent on active duty to the Pentagon, where the rebuilding from 9-11 had barely begun. He went on to serve at Central Command in Tampa, from where he was sent to Afghanistan for six months. He spent his Dec. 30th birthday that year hitching a ride on a helicopter and seeing what was beautiful countryside there. Of course, I told him he was an idiot getting on a helicopter over there when he didn't have to. He was stationed at Bagram Air Base, where you always wore your sidearm, and he made several trips to Kabul. His last station was Ft. Leavenworth, where he retired from the Army three years ago, but he is now working for Northrup Gruman, a contracting firm. In fact, Debs, he is now in Texas for a month. His active service was relatively safe, but it changed our family life forever. He has now been living elsewhere for 13 years, and gets home for visits. Our son was just starting high school, and our daughter was just starting college when he left. Hopefully, he will retire from his present job in a year or two. As I said at the beginning, all of the stories here are important, and I was touched by every single one of them. I have never understood how the brave men and women who have fought and served in wars have mustered up the kind of courage required. I am in awe and so grateful for their bravery. Last night I finished reading the latest Maisie Dobbs -- it is almost an elegy, about war and loss and grief and ideals. My father was a Marine NCO in the South Pacific -- he earned a Purple Heart, and he described horrible conditions of mosquito-infested jungle. He and three of his four brothers served overseas during WWII - one, Edward, did not return and he is buried in Holland. The war scarred my father and one of his brothers terribly -- emotionally. I feel very sad today thinking about the cost of war.